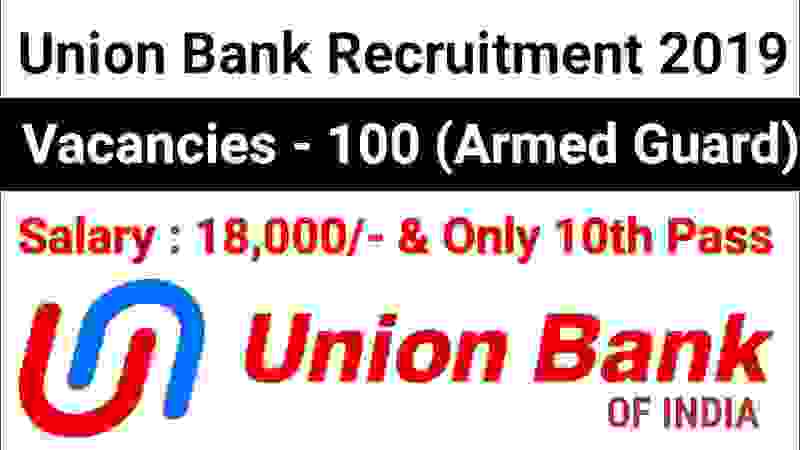 Union Bank of India,(hereafter referred to as Bank) a leading listed Public Sector Bank in its 100th Year of serving the Nation, with Head Office at Mumbai and having Pan India as well as Overseas presence, invites applications from eligible Ex-Servicemen candidates only, for filling up vacancies for the Post of Armed Guard in the Subordinate cadre through direct recruitment as per details given below. Pay Band: Rs.9560 – Rs.18,545 per Month. 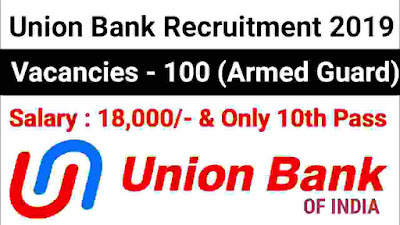 Educational Qualification: 10th pass from a recognized education board of India or any other equivalent qualification can apply for this Union Bank of India Recruitment 2019. Age Bond: Applicant age must be in between 18 years to 25 years for applying this bank Recruitment process 2019. Application fee for all Ex-Servicemen for applying this recruitment process is Rs.100. Paying Method: Applicants can pay the application fee through Debit Card, Credit Card, Net Banking. A. Selection will be through examination (online) strictly on merit and physical fitness test, subject to Reservation policy and guidelines issued by Government of India in this regard. B. The Selection Process shall be based on the following criteria; viz., (a) Online test and (b) Physical Fitness Test, aggregating to a Total Score of 100. Online Test shall be made available bilingually i.e. in English and in Hindi. 1. Applicants are first required to go to the official Bank’s website whose link is: “www.unionbankofindia.co.in”. After visiting to this website on the Home Page click on the ‘Recruitment’ Page Link to open the link “Armed Guard Recruitment 2018-19” and then click on the option “CLICK HERE TO APPLY ONLINE” to open the On-Line Application Form. 2. For the fresh registration, you have to choose the tab "Click here for New Registration" and enter Name, Contact details and Email-id in the online application form. After filling up the application form the Provisional Registration Number and Password will be generated by the system and displayed on the screen. Applicant should note down the Provisional Registration Number and Password. An Email & SMS indicating the Provisional Registration number and Password will also be sent. 3. In case the applicant is unable to complete the online application form in one go, he / she can save the data already entered by choosing "SAVE AND NEXT" tab. Prior to submission of the online application candidates are advised to use the "SAVE AND NEXT" facility to verify the details in the online application form and modify the same if required. 4. Applicants are directed to fill and verify the details filled in the online application themselves as no change will be possible/ entertained after clicking the FINAL SUBMIT BUTTON. 18th Feb. 2019 is the Last Date to apply.